Animal Consciousness. wp.nyu.edu/consciousness/animal-consciousness. The website for a conference held at New York University in November 2017 with an international array of scientists and philosophers such as Eva Jablonka (Abstract next), David Chalmers, Todd Feinberg, Joseph LeDoux, Diana Reiss, Bjorn Merker, and Marian Dawkins. 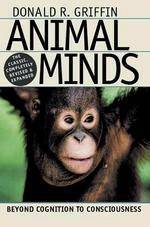 Consciousness in Human and Non-Human Animals. www.fcmconference.org.. As the proceedings of the Francis Crick Memorial Conference held in July 2012 at the University of Cambridge. Francis Crick (1916-2004), as you know codiscover with James Watson of the DNA double helix, in later decades turned his unique acumen to studies of cognitive sentience. This meeting brought together a leading array of neuroscientists such as Irene Pepperberg, Christoph Koch, Diana Reiss, Ryan Remedios, Jaak Panksepp, along with physicist Stephen Hawking. A typical presentation is “Through the Eyes of an Octopus: An Invertebrate Model for Consciousness Studies” by David Edelman. And a result, a closing “Cambridge Declaration on Consciousness,” excerpted below and which gained much press, (Google for full online), affirmed (or gave scientific blessings to what we all know) that our creaturely companions large and small are much as aware and smart as we. Cambridge Declaration on Consciousness On this day of July 7, 2012, a prominent international group of cognitive neuroscientists, neuropharmacologists, neurophysiologists, neuroanatomists and computational neuroscientists gathered at The University of Cambridge to reassess the neurobiological substrates of conscious experience and related behaviors in human and non-human animals. ….the following observations can be stated unequivocally: Furthermore, neural circuits supporting behavioral/electrophysiological states of attentiveness, sleep an decision making appear to have arisen in evolution as early as the invertebrate radiation, being evident in insects and cephalopod mollusks (e.g., octopus). Agrillo, Christian, et al. Evidence for Two Numerical Systems That Are Similar in Humans and Guppies. PLoS One. Online February 15, 2012. As a result of clever counting experiments with undergraduate students and aquarium fish, University of Padova, and University College of London, neuroscientists find the same cognitive faculties in effect across widely disparate, yet related, species. Angier, Natalie. Parrots Are a Lot More Than “Pretty Bird.”. New York Times. March 22, 2016. The Psittaciformes order of parrots, parakeets, macaws and cockatoos never ceases to amaze and inform, as this review of current research conveys. The premier investigator, Irene Pepperberg of Alex the parrot fame, advises that they are “feathered primates,” just as relatively intelligent and creative. By virtue of their clever food gathering, tool making, articulate calls, mimic skill, and group sociality, it would seems that such a behavioral complex similar to human cultures will evolve and develop wherever it possibly can. Anthes, Emily. Cold-Blooded Does Not Mean Stupid. New York Times. November 19, 2013. A Science Times report on how smart and foxy mammals are, which goes on to findings by Duke University’s Manuel Leal that all manner of reptiles – lizards, turtles, snakes - have similar acumens for navigational skills, problem solving to get food, learning through observation, along with social strategies. Aplin, Lucy. Culture and Cultural Evolution in Birds. Animal Behavior. Online June, 2018. A zoologist with dual postings at MPI Ornithology and Oxford University describes novel ways that along with a comparable cognitive acumen of individual creatures, animal groupings of many foraging and migratory kinds are being found to possess external, accumulated social mores. Arhem, Peter and Hans Liljenstrom. On the Coevolution of Cognition and Consciousness. Journal of Theoretical Biology. 187/601, 1997. An advocacy of the parallel increase of brain complexity and sentient mind. Avital, Eytan and Eva Jablonka. Animal Traditions. Cambridge: Cambridge University Press, 2000. A contribution to the incipient witness of culture in primates and mammals, which introduces a new domain of behavioral inheritance to supplant molecular genetic effects alone. Baars, Bernard. Subjective Experience is Probably not Limited to Humans: The Evidence from Neurobiology and Behavior. Consciousness and Cognition. 14/1, 2005. An introduction to a special issue: The Neurobiology of Animal Consciousness, dedicated its pioneer researcher Donald Griffin. An “unscientific” subject for most of the 20th century, not permitted by its materialist paradigm, there is today wide assent that a continuum of intelligence and awareness extends to primates, mammals, birds and even to simpler vertebrates and insects. What seems inescapable is a perception of creaturely evolution as a singular cerebral awakening and learning process, just now of planetary dimension. Balakhonov, Dmitry and Jonas Rose. Crows Rival Monkeys in Cognitive Capacity. Nature Scientific Reports. 7/8809, 2017. It pleases to report upon this later 2010s quantification, as we well know, of how smart animals are in their own clever ways. Here Ruhr-University Bochum psychologists quantify that the avian Corvidae genus (ravens, jays) has a behavioral intelligence as good as Simian primates. See also Ravens Parallel Great Apes in Flexible Planning for Tool-Use and Bartering by Can Kabadayi and Mathias Osvath in Science (357/202, 2017) and Crows Spontaneously Exhibit Analogical Reasoning by Anna Smirnova, et al in Current Biology (25/256, 2015). Balda, Ralph, et al, eds. Animal Cognition in Nature. San Diego: Academic Press, 1998. Essays about the integration of cognitive abilities in nonhuman species with their ecological and evolutionary context. Especially noteworthy are papers by Alan Kamil and Colin Beer. Bekoff, Marc. Animal Passions and Beastly Virtues. Zygon. 41/1, 2006. The animal advocate and scholar responds to an American Academy of Religion symposium on his work, whose papers by Graham Harvey, Donna Yarri, Jay McDaniel, and Nancy Howell, are also in this issue. Through anecdote, a defense of anthropomorphism, and evolutionary theory, Bekoff again calls for a rightful, emphatic sense of creaturely sentience.